The South West Region of Sydney was desperately short of aged care services for the Chinese and Indo-Chinese communities so the Foundation embarked on a plan to expand its hostel from 30 to 88 places. It received strong support for the project from Fairfield Council, the NSW Government and the Australian Government. The expansion of the hostel to this more economic size will ensure our long term viability. The new facility was completed in January 2014, with the assistance of a loan of $6 million from the Australian Government which must be repaid over ten years, along with interest set at the inflation rate. We are operating at full occupancy providing a range of services to meet the needs of both low and high care assessed residents as well as specialist services and secure accommodation for dementia sufferers. Respite services are also provided. To ensure the best possible support and services can be provided for the care of our residents we need on going community assistance and support. Although we receive Government operational support, additional funds are required to ensure our residents receive the best possible culturally appropriate care. If you can assist us with a donation it would be greatly appreciated and it will ensure that the best possible care and equipment can be provided to our residents. 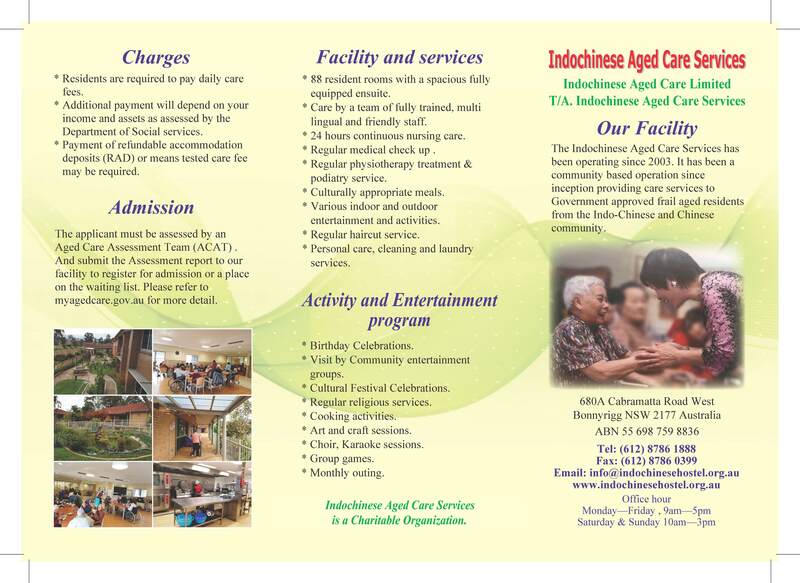 Please support us to continue our work in caring for the frail elderly in our community.